The SELR mission is to protect the quality of life and improve the well being of abused, neglected, unwanted and behaviorally unmanageable llamas and alpacas through prevention, education, intervention, placement and lifelong care. SELR is a 501(c) 3 non-profit organization incorporated in North Carolina. In situations where the owners are not able to keep or maintain their animals, SELR takes them in and ultimately finds new homes for them. Funded entirely by private donations and adoption fees, SELR assists new owners by providing basic care information and connecting them with local "mentors" who are able to provide assistance on a more personal level. In cases of abuse or neglect by llama/alpaca owners, SELR assists local law enforcement and animal control authorities toward the best interest of the animals, which may result in SELR taking possession and placing the llamas in a new home. We also work closely with various animal sanctuaries to ensure that those animals who require lifelong medical care are afforded the attention they need. When SELR gains possession of animals, they are vetted, trained, gelded if male and placed in pre-screened adoptive homes. Females are placed with a non-breeding contract. Read more about our non breeding policy here. We hope you'll help us save these wonderful llamas that so deserve our respect and care. 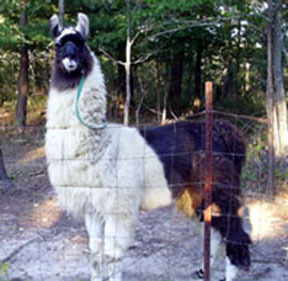 A note in regards to aggression: SELR has experience rehabilitating llamas that have been labeled with Berserk Male Syndrome or Aberrant Behavior Syndrome, as well as llamas that are fearful or have been mishandled or overhandled early in life and now exhibit aggressive tendencies or other unwelcome behaviors. If you have a llama or alpaca with behavior problems, SELR may be able to provide some assistance in determining the extent to which the behavior can be modified. Please contact your closest Adoption Coordinator to discuss your individual situation. We recommend our website's article, Dangerous Behaviors In Llamas by SELR co-founder Alvin Bean, for more in-depth descriptions of llama and alpaca behaviors.